California's lack of regulations for home schooling has “created a shield that allows this stuff to happen," an education policy professor said. 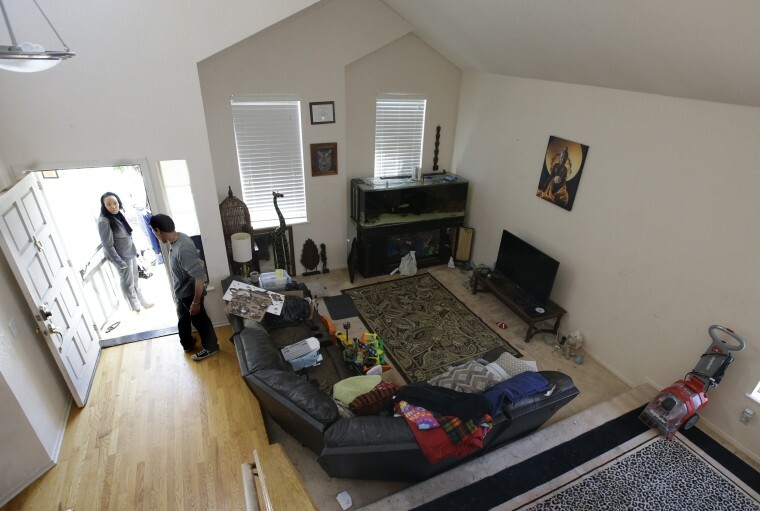 The arrest of a California couple accused of abusing their 10 children — including waterboarding them, shooting them with crossbows and pouring scalding water on them, prosecutors said — is the latest case to raise questions about the oversight of home schooling. The couple, Ina Rogers and Jonathan Allen, never sent their children to the local public schools in Fairfield, California, and school officials there said they did not have contact with them. Authorities have said the children lived in squalor and described intentional abuse that led to puncture wounds, burns, bruising and injuries consistent with being shot with a pellet gun. Rogers was charged Wednesday with nine counts of felony child abuse, and Allen, her husband, faces nine counts of felony torture and six counts of felony child abuse. They deny the charges. The case comes four months after the 13 children of David Allen Turpin and Louise Ann Turpin were found bound, shackled and malnourished at their Perris, California, home in January after one of the children managed to escape and tell authorities that her 12 siblings were being held by their parents. And it follows the deadly crash in March in which a car believed to be carrying the eight members of the Hart family plunged off a California cliff. Police said Jennifer Hart, who had faced child abuse allegations in three states, was drunk when she pulled off the coastal highway and intentionally drove the GMC Yukon with her wife and six children off the cliff. The children in all three cases had been taught at home by their parents. About 1.7 million children ages 5 to 17 were estimated to be home-schooled in the U.S. in 2016, according to the National Center for Education Statistics, and for the vast majority, nothing goes wrong. But child safety advocates say the absence of regulations around home schooling enables a small but alarming number of parents to abuse their children and avoid detection. Children who are taught at home have less contact with mandatory child abuse reporters like teachers and school nurses, advocates note. “This isn’t new — this is the unfortunate consequence of lack of oversight for home schooling,” said Rachel Coleman, executive director of the Coalition for Responsible Home Education, which advocates safe learning environments for home-schooled children. Home schooling laws vary by state. In California, parents who want to home-school their children can either register with the state as a private school, or they can join an “umbrella school” or charter school, which does not require them to submit their information to the state's database, Coleman said. Some of these umbrella schools have a physical address and offer group activities, while others exist only on paper. Either way, they give parents the ability to educate their children at home without notifying the state. “They don’t want their address or their names on any lists, so by enrolling in an umbrella school you just enroll, sometimes online, pay the annual fee and that’s it,” said Coleman, who was home-schooled from kindergarten through high school in Indiana. Efforts to add more oversight in California have faltered after meeting fierce opposition from parents who home school and say such regulations would interfere with their ability to educate their children as they see fit. Fourteen states have regulations similar to California’s, while others require no notification at all for parents to home-school their children. And only about half of states require home-schooled students to take assessment tests to ensure they’re learning, according to the Coalition for Responsible Home Education. Coleman said that while the recent California cases have received a lot of attention, her organization has charted dozens of similar incidents in the state in the past five years. The California State Department of Education told NBC News that Rogers and Allen had not registered their home as a private school. It remains unclear if they were home-schooling their children within the state’s regulations. The children were never enrolled in the Fairfield-Suisun Unified School District, said Tim Goree, the district’s executive director of administrative services and community engagement. “Until this case broke and we heard about it from the police, we have never had any contact with any of the children,” he said. Goree said it was possible the family had legally home-schooled their children “without ever checking in with a local school district” if they were enrolled in an umbrella school. “We wish we could have known and done something, but we had no idea,” he said. The state Department of Education said in a statement that it does not oversee how families choose to home-school their children. Rogers said child protection officials visited their home several years ago and interviewed the children, but nothing came of it. The agencies that would be responsible for those types of visits, California’s Child Welfare Policy and Program Development Bureau and Child Welfare Services in Solano County, where Fairfield is, did not immediately return requests for comment. Rogers told reporters this week that she chose to home-school her children after initially enrolling one of her sons and a daughter in a school and being concerned they weren’t getting enough attention. She also said that her daughter had been bullied. She did not name the school or comment on how she and Allen home-schooled their children. In the Turpin case, the family registered with the state to home-school their children, which should have prompted a mandatory inspection by the local fire department. But that never took place. A spokesman for the city said the state failed to notify it that the Turpins were operating a school out of their home. A report from Connecticut’s Office of the Child Advocate in April found that 36 percent of home-schooled children lived in families that had been subject to at least one prior report of suspected abuse or neglect from the state’s Department of Children and Families. The report covered children withdrawn from six school districts from 2013 to 2016. That report, which was prompted by the death of a home-schooled teenager who had been abused, also found that none of the six districts had protocols to follow up with such families. “There is no real mechanism to check in on a child simply because they are removed from school to be home-schooled after a troubled past,” Coleman said. In the case of the Harts, whose six children were adopted, authorities in Oregon, Washington and Minnesota all received reports of child welfare concerns before the deadly crash, according to NBC affiliate KGW. While living in Minnesota in 2011, Sarah Hart pleaded guilty to a misdemeanor domestic assault charge in connection to one of her daughters, court records show. After that case was resolved, the Harts removed all six children from public schools, according to The Oregonian. The family reportedly did not register their children to be home-schooled in Oregon. Search crews have found six bodies after the crash, and two of the children remain missing and are feared dead. The Coalition for Responsible Home Education advocates changes to home-schooling laws including requiring criminal background checks for parents, student contact with school or medical officials (who must report signs of abuse or neglect) and annual academic assessments. The coalition also calls for funding for government oversight of home schools. After the Turpin case, lawmakers in California introduced legislation this year that would have mandated more oversight of home schooling. But the bill died after parents who home-school turned out en masse to protest what they see as infringements on their rights. The Home School Legal Defense Association, a national group that fights additional rules for home schooling, did not immediately respond to a request for comment. In January, in response to the Turpin case, it said more regulations were not needed. “Home schooling parents around the country have demonstrated a high degree of success in raising and nurturing their children — giving them the tools to grow and flourish," the group added.